Canada Day: London edition was a celebration of all things Canadian. 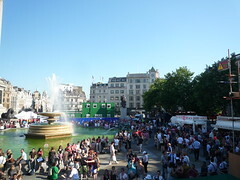 Whether a result of the economic downturn or green algae in the fountains there seemed to be fewer people than last year but for my money that benefited the event. For one I could walk fairly easily around the Square and the for the other accessing stalls (for food, drink or travel and work information) was significantly easier. 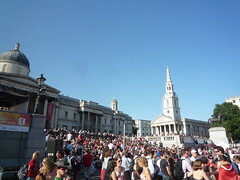 Trafalgar was awash with red and white with maple leaves covering bodies and clothes. The crowd – even with alcohol – was friendly and relaxed. 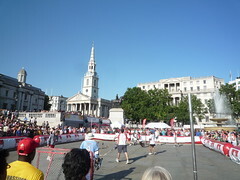 Events were hosted on both the main stage and a central court. While I was attending there was a hockey game between Oxford and Cambridge, with the former winning. Next year if you can make it you should try and stop by to look while grabbing a burger, sit on the steps and enjoy the atmosphere.